Am I glad and thankful I am living in Malaysia. No, I am not being patriotic. Neither am I professing my love for my country. When the typhoon Ketsana hit Philippines, Vietnam and Cambodia causing untold damage and loss of lives, I was thankful that Malaysia had never ever experienced such a devastating rage of nature. When the earthquake struck Sumatra, Indonesia, many Malaysians felt the effect of the tremors but we were relatively safe. The earthquake was too close for comfort, yet we were out of the danger zone. I was thankful and still am. When the tsunami smashed into the island of Samoa, it reminded me of the 2004 tsunami that killed more than 200,000 people in 11 countries on Boxing Day. I was holidaying in Singapore during the Christmas week, totally enjoying myself until I heard people talking about it! Was I shocked! Although the 2004 tsunami did hit us too, it was not as devastating as those other countries like Thailand, Indonesia and Sri Lanka. Boy, am I glad I live in Malaysia! There are typhoons, earthquake, tsunamis and volcano eruptions all around us, yet our country is considered safe from all these natural calamities. 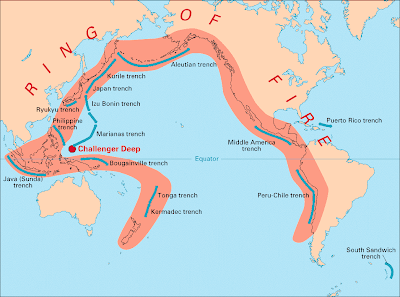 Did you know that Malaysia narrowly missed being included in the Pacific Ring Of Fire? Isn't Malaysia a blessed country? So were all these the effects (although delayed) of the total solar eclipse that happened on July 22nd this year? We have already been warned of major earthquakes, typhoons and tsunamis to happen during or after the eclipse. Was it mere coincidence that the series of natural disasters that had just happened occurred in countries that were located in the path of the solar eclipse on July 22nd? Will there be more to come? I certainly hope not! But of course, these disasters are nothing compared to what some doomsday soothsayers are already predicting for the year 2012. Meantime, I just keep counting my blessings and cannot help but feel how lucky we are to be living in home sweet home Malaysia. I've always been told Malaysia is the best! Because of its location. But if other "things" can be better like its location that would make thing perfect, isn't it? Water is a good servant but a bad master..prevailed over the helpless. Wonder how long we will be save. yeah, i am always thankful for living in this comparatively natural-calamities-safe country..
but from the image you've posted, looks like our country is inside the PROF area?? i think we would be slightly be excluded from that?? i'll join you with the blessings and hope there will not be any disasters anymore..
For this kind of situation I am thankful too. So far nothing major is affecting us.. but would be the earth is changing. We would soon be getting four season? Would soon be having all this earthquakes? Or is this the destruction of preparation of a new world? I'm thankful too. If you look at the world map, Malaysia is kinda like in a 'protected' shell... surrounded by other countries... except the South China sea area. I totally agree with your Foong...it is really not that we are trying to show off our patriotism or professing our love for the country but seriously if we are to compare to other countries, we are so much better off in everything...and we are just thankful with what we have.....and i am quite skeptical about the 2012 thing....what do you think? Yes, we are indeed lucky in Malaysia. Lots of factors contribute to that. The Earth is dying for one; karma is another. We'll probably cross over Dec 21, 2012 but not without a lot more happenings along the way. Life goes on..
Ok...should be grateful for living in Malaysia....which free from natural disaster..but we are not lucky because of something else... =__="
iamthewitch, 2012 is just 3 years away! But whether doomsday will happen remains to be seen. Yes, hope no more natural disasters. robo, well, we will just have to keep our fingers crossed. I heard that in the end days, earthquakes will happen at unlikely places ie. places that are deemed to be free from earthquakes. manglish, yes we are indeed better off in terms of natural disasters. I am not too sure of other things, though. Still, Malaysia is a wonderful place to live in! I am not too sure about 2012 myself, although a lot of theories point to that date. Still, I find it hard to believe that humans will be gone so fast because if you compare to dinosaurs, they survived for millions of years! How is it possible we only survive a fraction of their time? Agreed. We are blessed by other countries. Agree that we are lucky. But as far as weather is concerned, I vote for California. or maybe it is just a hoax so we heighten our consciousness ar? long time no chats..no updates..i was busy at school..huhu! whew! just done reading the post! yeah! you're blessed to having Malaysia such safe place.too bad for us here in phils.. Yes, we are blessed. So, take care and enjoy! Real sad about all these disasters. Malaysia only got Political Tsunami! i guess all of us are shocked and saddened by all the calamities that's been happening lately. Geographically speaking, Malaysia is the best! I feel that we are very lucky in some ways especially in the natural disaster department. But I'm sure that's a ll about to change since the global warming is happening and anything could happen to Malaysia too. Judging by the way things are going, it's only a matter of time when we one day will experience all those stuff too. I hope it's not in my lifetime though. I think that is one of a few reasons why I love my country. mariuca, oh! Thanks for voting for MC. Keep on voting, yes? We shall bring her to No.1 spot! Yay! yes, I m thankful too!! Hi Foong! After the various disasters that have devastated my country, the Philippines, I think there are still much to be thankful for. Good for you people of Malaysia that you are spared from these calamities. But I can't accept that it's "KARMA"! For HAPPY SURFER, please don't give wrong interpretations. And most importantly, Don't misjudge! i truly feel bad for those countries highly devastated by the calamities. In my homeland alone many lives were taken. I hope no more.... so many bad things happening.